I just uploaded another ten images into my now growing authentic, charming (admittedly not for everyone) French Country Kitchens album. I think it's because I just booked an apartment in Copenhagen this week for my vacation and I'm thinking vacation...villas...authentic European kitchens. I'll bet there are those who want to rent a home in France for vacation and experience living and cooking in one of these kitchens. I really hope they don't end up cooking meatloaf, that would be a crime and subject to banishment from French soil, FOREVER! But, I digress. If you're inspired to create a French country kitchen, a word of advice. Look at these images. Get inspired. But, also look for the details. For example, you may not care for the general look and feel of an entire kitchen, but look more closely, and you may see that you like the hood or the shelving or another detail. Don't judge any one of these too quickly. In a few cases, while I didn't love the kitchen, there was something about it which made me save it. Dozens and dozens and dozens of images I came across didn't make the cut. To me, these are the best of what I've seen. And, I'll lkeep looking. (Someone REALLY needs to distribute foolproof and upgraded cameras to the French population. In most of the cases, the quality of the images are abysmal.) Luckily, I can come to the rescue with my major image tweaking skills! 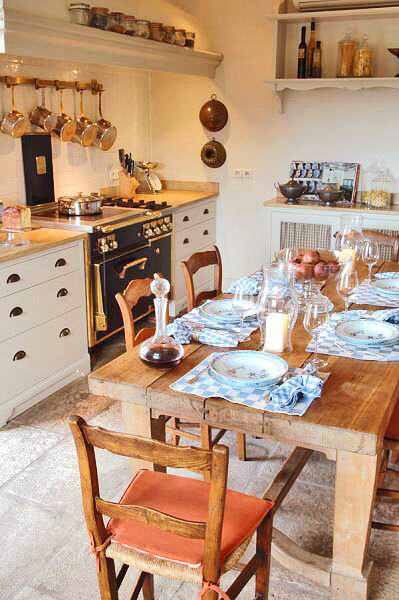 Want to take a vacation and stay in a wonderful French kitchen? Contact the source of these images, Just France.